Solids handling pumps are manufactured in a wide variety of configurations and horsepower ratings. 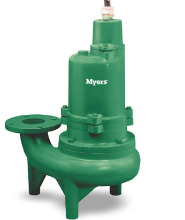 They are designed for pumping slurry and debris laden water in sump-type environments and are commonly used in industrial, sewage, waste water, paper pulp and construction applications where excessive solids prohibit the use of dewatering pumps. Pump Express customer service agents are standing by to provide technical assistance, price quotes or to answer any questions you may have regarding the solids handling pumps we stock and sell. Call Our Toll Free Number 1-800-298-4100.